In the north woods of Wisconsin, clear, clean lakes abound. Fishing is fine, and wildlife is plentiful. Outdoor recreation and adventure is a main draw for out-of-state visitors. 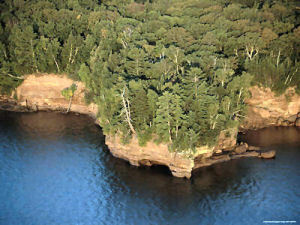 15,000 lakes are enjoyed by swimmers, fishermen and fisherwomen and boaters. The deep, cool woods provide wonderful hiking and horseback riding trails. Wisconsin is also a leader in the manufacture of machinery and produces more paper than any other state. This state was named after the Wisconsin River. Wisconsin means "grassy place" in the Chippewa language. This nickname originally referred to the lead miners, of the 1830s, who worked at the Galena lead mines in Illinois. These mines were in northwestern Illinois close to the borders of Wisconsin and Iowa. The Wisconsin miners lived, not in houses, but in temporary caves cut into the hillsides. These caves were described as badger dens and, the miners who lived in them, as badgers. This derisive nickname was brought back to Wisconsin by these miners. Eventually, the nickname was applied to all of the people of Wisconsin and, finally, to the state itself. The badger was adopted as Wisconsin's state animal in 1957. A more fitting nickname for Wisconsin, "The Dairy State" is in direct reference to the large production of dairy products, particularly cheese and butter, in the state. Another reflection of Wisconsin's dairy production and a phrase that appears on Wisconsin state license plates. Wisconsin has also been referred to as "The Cheese State" because of its large cheese production. This nickname is in reference to the Copper mines in the northern part of the state. People who live in Wisconsin or who come from Wisconsin are called Wisconsinites. The Wisconsin quarter is the fifth of 2004, and the 30th in the 50 State Quarters® Program. On May 29, 1848, Wisconsin became the 30th state to be admitted into the Union. The Wisconsin design depicts an agricultural theme featuring a cow, a round of cheese and an ear of corn. The design also bears an inscription of the State motto, "Forward." Wisconsin adopted the State motto, "Forward," in 1851, reflecting Wisconsin's continuous drive to be a national leader. Wisconsin is considered "America's Dairy Land" with production of over 15 percent of the Nation's milk. Wisconsin also produces over 350 different varieties, types and styles of award-winning cheeses -- more than any other state. There are approximately 17,000 dairy farms, with just over one million cows that produce an average of 17,306 gallons of milk each, per year. Wisconsin is also a major corn-growing state. In 2002, Wisconsin led the Nation in corn silage production and, with 391.5 million bushels produced, it ranked fifth in the production of corn for grain (shelled corn). State corn production contributed $882.4 million to the Wisconsin economy in 2003. Wisconsin is also a leading supplier of mint. In December 2001, Governor Scott McCallum appointed 23 people to the Wisconsin Commemorative Quarter Council to review and recommend candidate design themes. The state received over 9,600 suggestions, and the Council narrowed the concepts to six. After a statewide vote, Governor McCallum submitted three design concepts to the United States Mint - "Scenic Wisconsin, " "Agriculture/Dairy/Barns " and "Early Exploration and Cultural Interaction. " 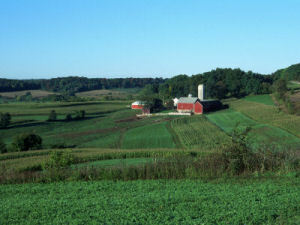 In 2003, Governor Jim Doyle coordinated a statewide vote to select the final design, in which the "Agriculture/Dairy/Barns " design was the popular choice. This design was approved by the Secretary of the Treasury on October 9, 2003. Wisconsin (From Sea to Shining Sea) , by Bettina Ling. 80 pages. Publisher: Scholastic Library Publishing (March 2002) Reading level: Grades 3-5. Presents information about Wisconsin's people, geography, history, landmarks, natural resources, government, state capitol, towns and cities, and more. Wisconsin (World Almanac Library of the States) , by Rachel Barenblat. 48 pages. Gareth Stevens Publishing (December 2001) Reading level: Grades 4-6. Filled with the most up-to-date information, including the latest Census results. Full-color photos bring to life the story of Wisconsin. In addition to an in-depth factual profile of Wisconsin in the form of a state Almanac, this book offers fascinating and lively discussions of the state's history, people, geography, government, economy, culture, and lifestyles. A section on Notable People, a calendar of events, and enough primary source documents, time lines, maps, and other tools to make this unquestionably the best young adult reference material on the USA available anywhere. The Wisconsin Almanac , by Jerry Minnich. 200 pages. Publisher: Trails Media Group (April 30, 2006) Great-grandpa and grandma turned to their almanac for practical wisdom and wholesome entertainment. The NEW Wisconsin Almanac brings you the same information, advice, and fun that gardeners and homemakers have relied on for generations--all specially selected for the Badger state! Wisconsin: A History , by Richard Nelson Current. 240 pages. Publisher: University of Illinois Press (September 26, 2001) A haven for summer tourists and winter sport enthusiasts, Wisconsin is famed for its physical beauty and its prodigious production of cheese and dairy products. Richard Nelson Current's compact history reveals the colorful past of America's Dairyland, from early explorers and gangsters to sports heroes and cheeseheads. Fast-paced and entertaining, Current's history chronicles how Wisconsin's homegrown ideas, from the "Wisconsin Idea" of efficient state government to ski-tows and speedometers, made their way into the broader marketplace of American culture. It Happened in Wisconsin , by Michael Bie. 176 pages. Publisher: TwoDot; 1st edition (June 1, 2007) From the sinking of the Edmund Fitzgerald to the attempted assassination of Teddy Roosevelt, It Happened in Wisconsin gives readers a unique look at intriguing people and episodes from the history of the Badger State. Find out how Wisconsin's dairy farms came to produce some of the world's finest cheeses. Learn how a raging wildfire in Peshtigo killed as many as 2,400 people. And discover how Joe McCarthy evolved from an amateur boxer into one of the country's most infamous senators. In an easy-to-read style that's entertaining and informative, author Michael Bie recounts some of the most captivating moments in the history of Wisconsin. On the Road Histories: Wisconsin , by Mark D. Van Ells. 235 pages. Publisher: Interlink Books (July 30, 2008) Starting with the days when massive glaciers covered the landscape, Van Ells brings us on a journey through the fascinating history of the Badger State. Wisconsin remembers the French voyageurs, the brutal Black Hawk War, the booming migration of thousands of settlers, it's progressive political traditions, and the famous Vietnam protests at University of Wisconsin. Included are recommended museums, state parks, and other attractions. Birthplace of such notables as Frank Lloyd Wright and Georgia O'Keeffe, Wisconsin is a state rich in culture that easily outdoes the stereotypes of harsh winters and sprawling flat American dairy land.